FedEx®, UPS®, or DHL® ! Fresh Fish isn't fresh if it sits in a truck for 2 days. SSL (Secure Socket Layers) encryption technology to ensure a safe, secure transaction. confidence and security online at AlwaysFreshFish.com! AlwaysFreshFish.com will never share, sell, or distribute any personal information from our customers! At AlwaysFreshFish.com we purchase Mako Sharks from the United States and South America. Being conscientous of over fishing we only except Mako Sharks that are over the legal minimum size and weight so that the fish have had the opportunity to reproduce. Mako Sharks are very popular and are often substituted for Swordfish in recipes calling for Swordfish. Fresh Mako Shark, though similar to Swordfish has meat that is slightly lighter and is almost always moister with a less meaty texture. Mako Shark steaks are boneless and are very easy to prepare. 1 lb. Fresh Mako Shark + 4 lbs. Add. Selections = 5 lb. Total Order OK! 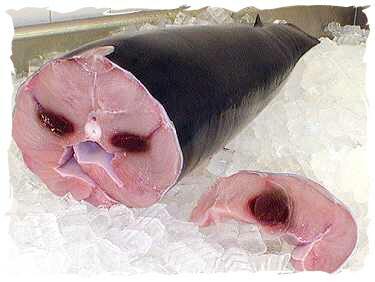 For additional information on Fresh Mako Shark, please e-mail AlwaysFreshFish.com. Fish and Seafood require expert handling to maintain the freshness of the product. We use Federal Express® or UPS® as our primary shipping company as their quality and experience are second to none. All orders are shipped SIGNATURE RELEASE - NO SIGNATURE REQUIRED. This means that if no one is there to receive the order from FedEx® or UPS®, the driver will leave the order at the door. This signifies acceptance of the order (the same as a signature). You will be responsible for payment of the order. We highly recommend that someone is there within the designated timeframe to accept delivery of the order and promptly refrigerate it. We recommend the use of the FedEx® or UPS® tracking number (we will e-mail you the tracking number when the order is shipped), to monitor the delivery of your order. If this is a gift, please be sure to alert the recipient that something perishable is coming via FedEx® or UPS® and to try and make arrangements to accept delivery and immediately refrigerate it upon receipt! Receiving your delivery fresh and delicious is our priority! We must therefore follow a schedule which will insure that your order is received in a timely manner and in excellent condition. For any special needs or requests please feel free to contact us. on late arrival of delivery due to shipping delays. FedEx® and UPS® try their best to deliver every package on time. Unforeseen factors (ie. extreme weather conditions) may affect delivery times. A Division of Ron Smith Seafood Inc.
as well as money orders. All images copyrighted by AlwaysFreshFish.com and Ron Smith Seafood Inc.